Dhyan Chand was born in Allahabad. His father worked in British India Army and traveled to different cities on numerous duty transfers. Chand had two brothers, Mool Singh and Roop Singh, and they later settled in Jhansi. Dhyan Chand has no inclination towards hockey in his early day and didn't play the sport much until he joined the army. He started practicing Hockey after he joined Army. With no floodlights in that time, he would practice under the moonlight after his work hours. Sighting his passion for the game, his friends named him 'Chand', that translates to 'Moon' in Hindi and gradually with each tale, his name from Dhyan Singh changed to Dhyan Chand. 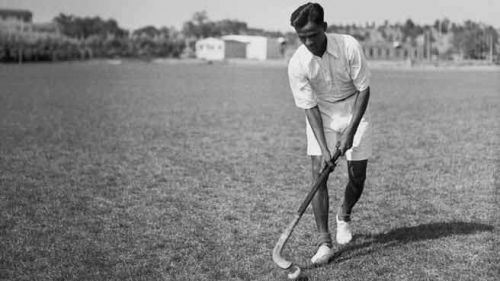 In his early years(1922-1926), Dhyan Chand exclusively participated in Army hockey tournaments before becoming an integral part of the team that was expected to participate in the 1928 Amsterdam Olympics. He was promoted to the higher ranks in the Army based on his outstanding performances in hockey tournaments. Dhyan Chand was a prolific goal Scorer. He scored more than 400 international goals and over 1000 goals overall in his career that spanned just over 20 years. While admiring his goal-scoring ability the greatest cricketer of all-time Sir Donald Bradman had once said, "He scores goals like runs in cricket". In its first outing in the Olympic games in 1928, India was pooled in a hostile group with Austria, Belgium, Denmark, and Switzerland. Chand scored 14 goals in 5 games in the tournament to help India win its first Gold in the Olympics. Quoting India's magical performance, one newspaper wrote-"This is not a game of hockey but magic. Dhyanchand is in fact the magician of Hockey"
Strangely, the England hockey team had not participated in the 1928 Berlin Olympics after suffering the defeat at the hand of the Indian Olympic team in London Folkestone Festival in 1927. After their humiliating defeat, their apprehension was best explained in a book named 'Romance of Hockey' as- 'a fear of meeting the full-fledged Indian side in a full International encounter'. Indian hockey was on a rampage in his time. They just didn't defeat but defeated hands down. They sailed to Los Angeles for their another tryst with the Olympic Gold in 1932. In their first game, India defeated Japan by 11-1 after defeating other opponents they advanced to the finals. In the final, India played against the hosts the USA and won 24-1(world record until 2003) to clinch another gold. After the Olympics, India went on an international tour covering USA, England, Netherlands and few other European countries. At the end of the tour, India had won 34 games out of 37 played. Chand scored 133 of 338 goals on that tour. Chand had an audacious character, not just with his hockey stick but with his words too. In 1936, he was handed the charge of the captain in Berlin Olympics. In the iconic encounter against Germany in 1936 Berlin Olympics final, he scored three goals to help India win its third Olympic Gold. Amazed with his abilities, Adolf Hitler offered him a well-to-do offer of working in the German army, which was politely turned down by Dhyan Chand. His hockey stick maneuvering skills were magical. He displayed unwavering control over the ball. It is said he practiced balancing the ball on railway tracks while running along the length of the tracks. His control was so steady that, as said, once while playing in the Netherlands he was called upon by the authorities and his stick was broke-open to check for a magnet in it. He also had an astute understanding of the game in every sense. In one game, even after his hard attempts, he was unable to score goals. He then appealed and argued with the match referee and asked for the remeasurement of the goal post. To everyone surprise, the goal post was not complying with the standard measurements as per the international rules. Balbir Singh Sr is considered as the best scorer in the Indian Hockey. KD Singh can be attributed as the best distributed and dribbler but Dhyan Chand will always be recalled as the most complete player in Hockey. He was the torch bearer of the golden period in India Hockey that lasted from 1920-1980. India won 8 Gold, 2 silver, and 1 bronze in this period. This includes six consecutive golds from 1928-1956. In these years, the game's impact was way beyond the hockey field. After India's heroics in the final of 1932 Los Angeles Olympics, a local newspaper wrote- "The all India field hockey team which G.D. Sondhi brought to Los Angeles to defend their 1928 Olympic title, was like a typhoon out of the east. They trampled under their feet and all but shoved out of the Olympic stadium the eleven players representing the United States." The world outpoured love and respect and embraced Dhyan Chand with all heart. A statue of the legend with four hands and four hockey sticks is erected in Vienna(Austria) depicting his master control over the ball. An astroturf hockey pitch is named after him in Indian Gymkhana club in London. Germans named a street after Dhyan Chand's mesmerizing play and London has shown its respect by naming a London tube station after him. Dhyan Chand retired from the army in 1956 from the rank of Major. He was conferred for the third highest civilian award Padma Bhushan in the same year by the Government of India for his distinctive contributions to the game. On National Sports Day, President of the Republic of India honors lifetime achievement award in Sports as 'Dhyan Chand Award' every year since 2002. He also awards Rajiv Gandhi Khel Ratna, Arjuna Award and Dronacharya award on this day. But his final years were spent in misery, and he largely lived a forgotten life. He was diagnosed with liver cancer and had scanty pockets. After retirement, he mostly restricted himself with coaching. He was unhappy with the lack of support from the government. Dhyan Chand had predicted that he would be forgotten and his pain was evident in his words. He had said,"When I die, the world will cry, but India's people will not shed a tear for me". "You are a doubtless aware that I am a common man, and then a soldier. It has been my training from my very childhood to avoid limelight and publicity. I have chosen a profession where I have been taught to be a soldier and nothing beyond that." In Ahmedabad, he was once denied the admission into the ground and was asked to stand in a queue to watch the game with his wards. It is so ironic that the man, when at his best, had the world lined up to watch him play, was asked to queue to buy tickets in his twilight years. However, Government of India has tried to make efforts to honor his glory but they haven't seemed enough. 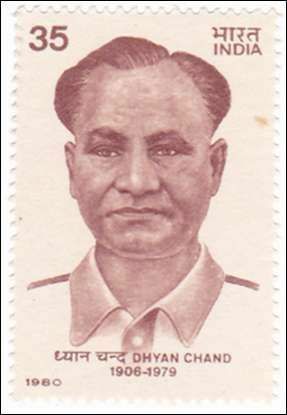 The government issued a postage stamp and a first day cover in honor of Dhyan Chand exactly one and the half-year after his death. He was the first player to receive this honor. After the rules were bent to induct sports in the category list of Bharat Ratna, the highest Civilian award, it was expected to be awarded to Dhyan Chand first for his incomparable achievements and contribution to the Indian sport. But Sachin Tendulkar was preferred ahead of Dhyan Chand. This instigated the clamor- 'If Sachin then why not Dhyan Chand?' Bharat Ratna is the only honor missing from Dhyan Chand's accolades list. However, recommendations have been pouring in from Home Ministry to consider Dhyan Chand's name for the honor with the hard-pressed demands of Dilip Turkey, Ajit Pal Singh, Zafar Iqbal, Sandeep Singh and Ashok Kumar(Dhyan Chand's son). It is high time to consider him for this award and confer it to him posthumously. Dhyan Chand's uncanny skills and wizardry just didn't score goals on the hockey field but scored it into the hearts of every hockey lover across the globe. He voiced India in the times of struggle with his hockey stick and ushered India into its golden age of hockey. His contributions should not be forgotten. Every year we celebrate and commemorate his birth anniversary as the National Sports Day. Though one day is enough to celebrate Dhyan Chand but this National Sports Day, let's remember the legacy of India's first sports role model and pledge to learn and take Indian sports forward.